recommended for: Fans of Diana Wynne Jones, Neil Gaiman, Newt's Emerald by Garth Nix, or other whimsical fantasies. My love for Dream a Little Dream verges on the obsessional, particularly when Henry Harper is concerned. I mean, can you get much better than a poetry-reciting, guitar-playing, sarcastic British boy? No. No, you cannot. Oh, and the book itself happens to be exciting and magical and tongue-in-cheek. It's a major win for young adult fantasy. While Dream On has a bit of sophomoritis, it's a worthy sequel and a charming addition to what promises to be a thrilling trilogy. After the harrowing events of the first book, Liv Silver is ready to have a normal year. She's dating the glorious Henry, becoming closer with her new stepfamily-to-be, and growing in her dreamworld powers. But everything isn't quite as magical as she'd hoped. Her boyfriend is MIA except in dreamland, her step-grandmother passionately and vocally loathes the Silvers, and her dreamland is being invaded by old enemies and sinister new occupants. Oh, and her sister Mia is sleepwalking in increasingly dangerous ways. And school blogger Secrecy seems to know everything about Liv and isn't afraid to post it for the whole school to see. The set-up is the perfect amount of mysterious and playful, if not a little frustrating--mostly because of Henry freaking Harper, who makes some rather questionable decisions that make me want to punch him. We do find out a lot more about his family, though, in ways that deepen and broaden his character. The hunt for Secrecy intensifies, although I feel like I still wanted more on that front. And I love Liv's devious streak. She's not your simpering good-girl. The best, however, is the problem of Mia's sleepwalking. Partly because it involves Mia, who is hysterical and precocious and snarky, and partly because that thread is dastardly and intriguing enough to pace the book along nicely. Like I said, there's a bit of middle book syndrome. Pieces are clearly moving, plots evolving, threads weaving together, but I just wanted more. I didn't feel like we were given as much closure as in the first book. Instead, there's a lot of buildup with only moderate amounts of payoff. Which means book three will probably be fantastic, but it made this one feel a bit hazy. Not enough to make it less than a 4, however, because Kerstin Gier is the master of toeing the line between playful and dark. The resulting prose dives between moments of lip-biting hilarity and differently-lip-biting peril, always with a veneer of sarcasm that's absolutely Liv. Not to mention her gorgeous, innovative dreamscapes! If you're looking for something light--but not too light--then the Liv Silver trilogy is a must-have. 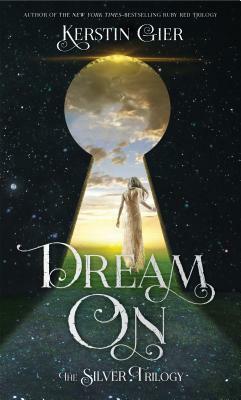 Dream On is a scintillating sequel full of fantastical dreamworlds, swoony romance, and Gier's trademark mix of snark and darkness. will i read this author again? Yes, preferably ASAP. will i continue the series? Must. Have. Now. It's really fun! Thanks! I hope you check it out and enjoy it.